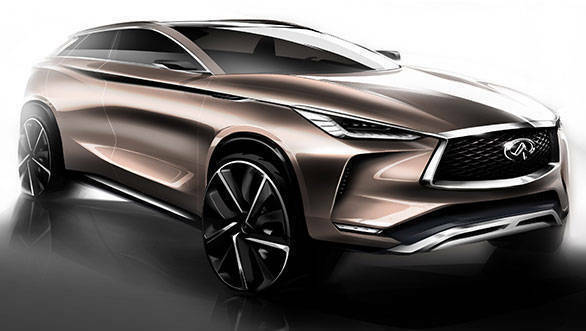 Infiniti has revealed the QX50 Concept before its global premiere at the 2017 North American International Auto Show in Detroit. The concept is a step-up from the 2016 QX Sport Inspiration which was unveiled at the 2016 Beijing Auto Show. 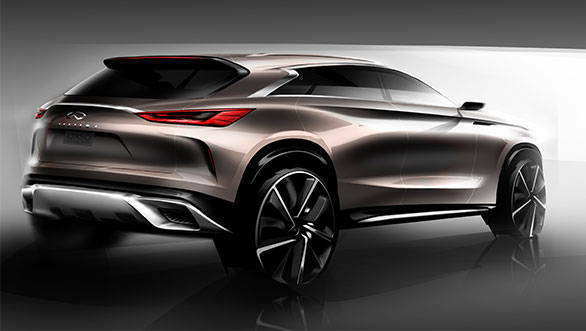 The Hong Kong-based carmaker claims that the concept shows what future Infiniti QX SUVs would look like. The QX50 Concept also previews Infiniti's autonomous driving technology and production-ready variable compression ratio engine. With its autonomous technology, Infiniti wants to focus more on driver engagement wherein the drivers retain ultimate control over their vehicles. The company claims that its "autonomous drive technologies will act as a 'co-pilot' for the driver, empowering rather than replacing them, and 'delegate' more onerous driving tasks to the car  such as navigating stop-start traffic on the highway or keeping track of the positions of surrounding vehicles". Infiniti will also showcase its new VC-Turbo (Variable Compression Turbo) engine technology in Detroit. The company claims that its VC-Turbo engine comes with the power of a 2.0-litre turbo petrol engine and the torque and efficiency of an advanced diesel mill. Dubbed as an alternative to diesel powertrains, the VC-Turbo is expected to produce 270PS and 390Nm of torque. The technology seamlessly raises or lowers the reach of the pistons and selects the most suitable compression ratio for current driving conditions. The engine is able to offer any compression ratio between 8:1 for high performance and 14:1 for high efficiency. Infiniti also claims that the engine would offer 27 per cent more fuel efficiency than a V6 petrol with a similar output. Only time will reveal if "the arrival of the VC-Turbo will establish new benchmarks  for power, efficiency and emissions  against which future powertrains will be measured".